Transfer from your hotel in Guatemala City to Antigua Guatemala. 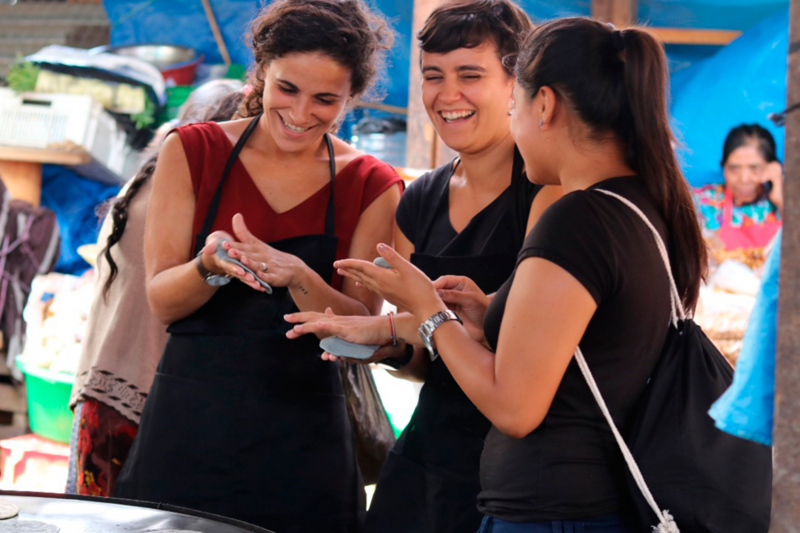 In Antigua you will meet our guide specialized in gastronomy and will start at the central park with an introduction to the Guatemalan Gastronomy History. The Central Park is located at the heart of the city, surrounded by the traditional grid pattern frequently utilized in Spanish urban planning in the colonies. The park is surrounded by the Palace of the Generals Captain, City Hall, the church of San José (formerly the Cathedral of Guatemala), the Archbishop’s Palace and the Portal of Commerce. Here, visitors will also find the Mermaid´s Fountain. The Count of Gomera (Gomera is the word for a rubber plantation) built the fountain in remembrance of a popular legend, which tells the story of a King whose daughters gave birth but did not want to nurse their children. Will learn about this famous story as you immerse yourself in the colonial history of the city. We are going to walk to the Antigua Guatemala Market (we will learn about the history of the grains, vegetables and fruits) During our walking we will admire the architecture of the colonial City of Antigua. Continuing our experience we will taste local dishes and we will know about its history, we will have the opportunity to meet the most important dishes for the Guatemala Gastronomy, These creations of culinary art were born during the sixteenth century and represent the fusion of pre-Columbian cuisine with ingredients of Hispanic Arabic origin. Most of the dishes are made with vegetables, meats and spices. Also we will have the opportunity to taste an icon dish of Antigua Guatemala, well known for its peculiar flavor and ingredients that make it up. We are going to visit an emblematic restaurant of Antigua Guatemala well known for its variety of local dishes, we will know what kitchens were like in ancient times and we will taste a delicious Guatemalan desserts made with local ingredients, Then continuing our experience we will visit a Guatemalan typical candy shop where we will learn about the elaboration process and history also will appreciate the handmade candies and made of local ingredients and fruits, on our walking we will appreciate the Santa Catalina Arch. Then we are going to visit La Merced Church an amazing baroque church, this church is one of the most emblematic buildings of La Antigua Guatemala, since it has an admirable baroque style elaborated in stucco. At the end of transfer back to your hotel.